Most organizations are being driven to change from trends and forces outside the organization, and also from drivers within the organization. 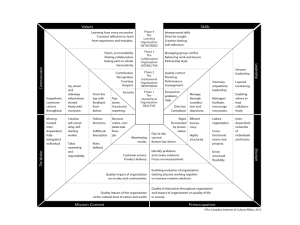 ToP tools allow your entire staff to see and understand all the overt and hidden drivers that are calling for change, and to respond to them with innovation and commitment. ToP turns fear into resolve. Transformation can refer to structural changes, additions to products or services, modes of operation, and staffing shifts. ToP tools help determine the transformation and the best ways to make those changes happen, with leadership and staff all on the same team and pulling in the same direction. 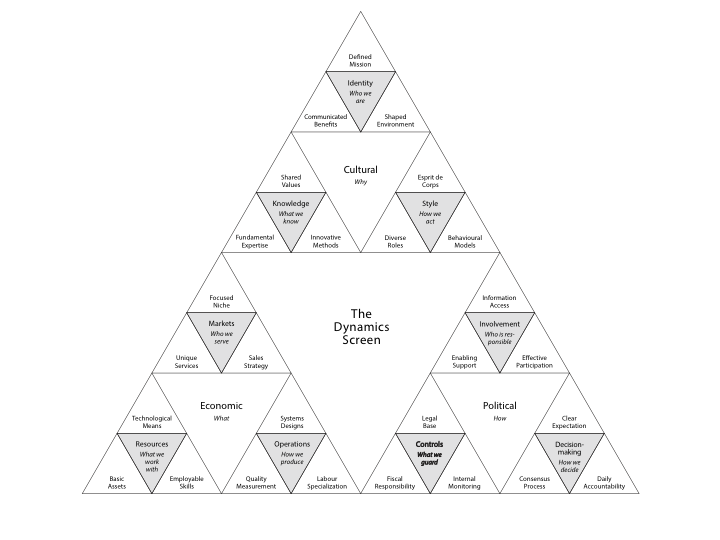 Dynamics Screen Leveraging pinpoints those spots within an organization where the minimum energy can leverage the maximum positive change. It empowers a group by outlining a comprehensive view of the scenarios and dynamics of transformation. 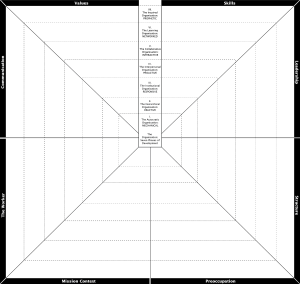 The Organizational Journey Map empowers people in an organization by providing a concrete map for the evolution over time of eight important aspects of the organization. It provides a diagnostic of the transformation that is desired as well as a strategic launch of the necessary changes. 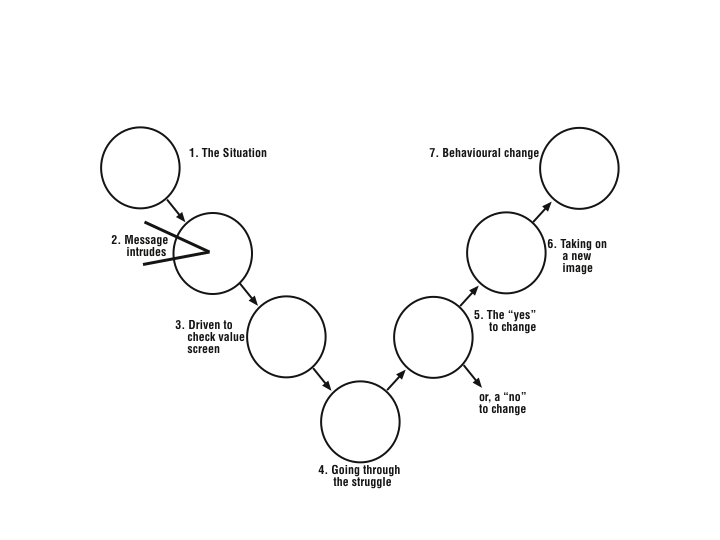 The Personal Change Journey describes how major change occurs within an individual and empowers people by showing how unconscious blocks to change actually operate. Once people know this journey they can take charge of their own transformation if they want to, or plan out the type of transformation that they really would like. The journey of personal change can be done in a solitary way, or with support, or can be coordinated with, for instance, an organizational transformation. 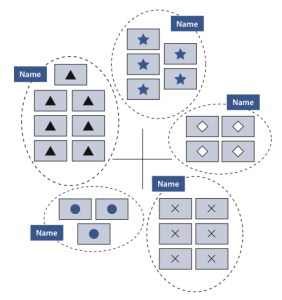 A Contradictions Cluster safely shows an individual or an organization the precise nature of the tension that exists between the changes one wants in the future versus the current reality one wants to retain. 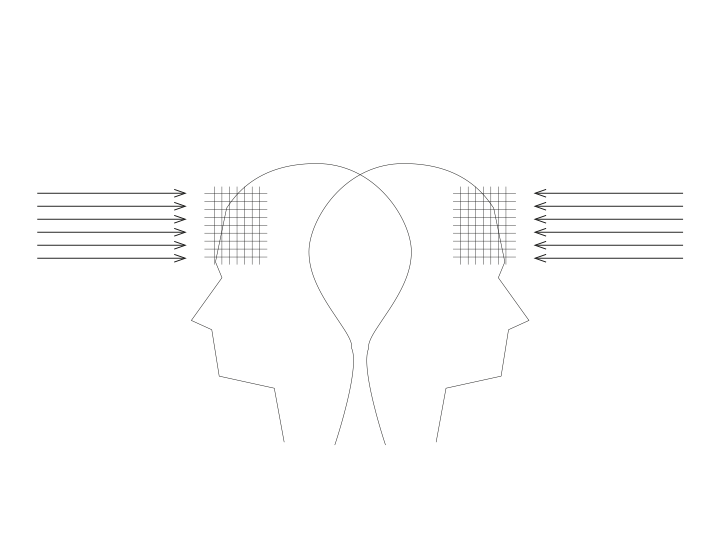 Understanding the nature of such clusters of contradictions opens up the door to highly effective strategy. The Power of Image Behaviour Shift is a highly empowering tool that shows the step-by-step process by which one programmes oneself to undertake a behavioural shift to new desired behaviours. It can also be used by a group to programme a shift in its own group behaviours. The power of image behaviour shift only works if one consciously desires a change, therefore, cannot be used by one party to manipulate another. 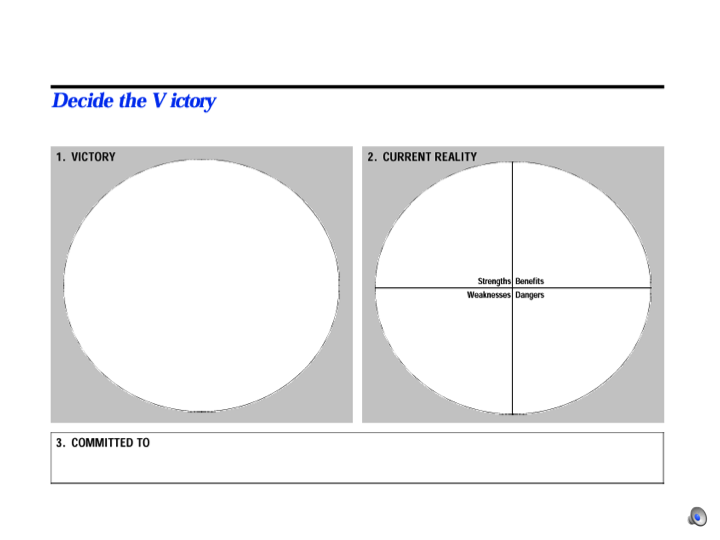 The Victory Circle generates a measurable and time bound description of goal or accomplishment that the whole group is committed to. This is especially important with short term goals to create momentum for the larger transformation.